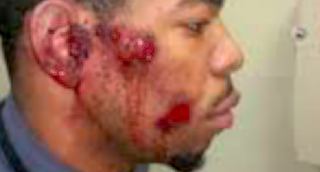 A St. Louis County, Mo., police chief has apologized to a 22-year-old student who was brutally beaten by police officers who were pursuing another man, according to Raw Story, citing a report at KMOV Channel 4. The incident began Thursday while officers were pursuing a suspect named Anton Simmons on Interstate 70 outside St. Louis. Student Joseph Swink lost control of his car and crashed as he tried to clear a path for police vehicles, St. Ann Police Chief Aaron Jimenez said in a press conference on Friday, the report says. When Swink’s car became filled with smoke, he darted from the vehicle, only to be tackled and beaten bloody by officers who mistook him for Simmons, who had 17 separate warrants out for his arrest, according to the news outlet. Swink, an accounting student at University of Missouri-St. Louis with no criminal record, reportedly suffered serious injuries to his left ear, and his vehicle was totaled, the report says. He was on his way home from an internship when he unwittingly became involved in the police chase.